It comes as no suprise for many that the Ventana Inn Big Sur CA, has been ranked by leading travel experts as among the most sought after hotels anywhere, where you can enjoy a pampered and memorable experience. Travel Leisure magazine wrote that Ventana is among the top 500 hotels in the world, and Andrew Harper ranks this beauty along the Big Sur coast, as one of the best 20 places to stay in the United States. The inn is perched on a 243 acre hillside setting, and offers a splendid view of the southern Big Sur Coast and forest covered hillsides. As you arrive at your Ventana destination, you drive through a canopy of ancient redwoods on a narrow uphill strip of road that leads you to a complementary glass of wine. If you have ever traveled into similar redwood groves in California, you might remember the grandeur that overtakes you when in the midst of these 400 foot tall mammoths ... some hundreds of years old. Many guests have described a sense of calm that overtakes them as they approach the hotel lobby and realize that their escape is about to begin. The Ventana Inn at Big Sur was built in 1975 by the legendary music producer Larry Spector. Spector had finished the movie "Easy Rider" filmed in 1969 which served to introduce actors Peter Fonda, Jack Nicholson and Dennis Hopper to the big screen. The movie of course was a giant success, and the revenue made was used to build the Ventana Inn, and a private residence for Mr. Spector just above the grounds of Ventana. 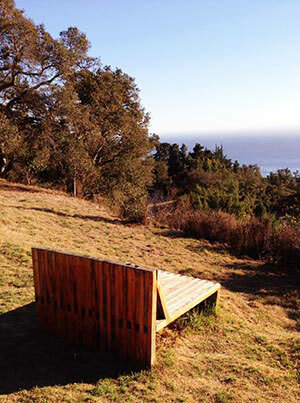 Ventana Inn Big Sur ... A Place To Relax! The early Spanish settlers called this land the "Big Country of the South" and was a place of rest for them as they traveled northward. Today, the Ventana Inn is the place of respit for many famous actors and actresses, music icons and prominant telivision personalities. Steve McQueen and Ali McGraw were the very first guests here, quickly followed by many others including Opra Winfrey who celebrated her birthday at Ventana. Built out of redwood and stone, there is a casual elegance here. The 60 rooms are scattered in the canyons and hillsides of Big Sur and offer views of meadows, hillsides and the Pacific Ocean. Turkeys and mule deer seem to come from nowhere as the sun goes down and are often encountered on the almost two miles of trails on the property that weave in and out of the gnareled oaks and redwoods. Many of the rooms have wood burning fireplaces, four poster beds, million thread count sheets, huge redwood decks with mesmerizing views of virgin forest and open spaces. Large hammocks, telescopes and hot tubs can be found in many of the rooms at the Inn. Upon arrival you are greeted with a glass of wine and a short time later ... a cheese tray to help get you acclimated to the level of service here. There is a generous breakfast served in your room each morning or you can join other guests in the restaurant. a short walk away. Two large pools, a sauna and Japenese baths are available to guests. There is a male and female soaking tub wrapped in redwood with stone floors. Stripped green and white towels are provided so no need to cart your own from the room. The pool near reception is clothing optional. If you have a desire to leave this place during your stay and explore a bit, the staff will take you by Land Rover to the famous Deetjens Big Sur Inn, the popular Nepenthe Restaurant or even to the pricey Sierra Mar at the Post Ranch Inn for dinner. While the architecture and amenities at Ventana Inn Big Sur are amazing, the 1975 design suprisingly did not carefully consider room privacy. The walls are thin and apparently not insulated, so you might consider a room with an upper floor or one of the private cottages to be sure you quiet retreat is all you expected. Since the Ventana Inn Big Sur is miles away from the kind of light pollution that plaques city life, consider the Stary Stary Nights Package. The three night package includes a $200 Ventana Restaurant Voucher, a $300 credit at the Ventana Spa and all the Yoga and Pilates you can manage. When your busy day in Big Sur is complete, you can look forward to a night sky carpeted with so many stars, you might think you are looking thru a telescope. While most who visit here stay att Ventana Inn Big Sur to take full benefit of the setting, some also take advantage of Ventana's proximity to Hearst Castle only 69 miles south from Big Sur. On the way, there are a couple of gorgeous beaches where you can stop for a picnic. Sand Dollar Beach is a favorite where you can walk hand in hand for quite awhile. Prices at the Ventana Inn Big Sur are based on supply and demand. Rates during their less traveled time during spring and fall, can be substantially more affordable. The website luxurylink.com can sometimes save you considerable money even during the summer if you book mid-week. The Big Sur Suite rate is typically about $800 a night, but you can save $500 if booked for at least for two nights in summer. Hiking in Big Sur is one of the best ways to really experience the real Big Sur. Although there are about 2 miles of trails on the property here, consider joining Stephen Copeland on his small group tours to both public and private trails that most don't get a chance to see when they stay in Big Sur. His groups leave from the reception room at the Ventana Inn Big Sur, so you might ask when you book a room if this appeals to you. 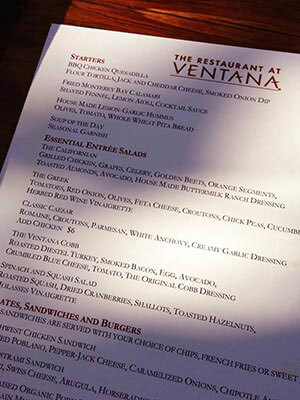 The Ventana Inn Restaurant previously call Cielo's has a huge outside deck area that offers some of the best views of Big Sur anywhere. The restaurant is built from huge timbers to create a lodge-like ambiance and a very long redwood bar helps to set the mood. Not Just A Getaway But A "Real Get Away"
Getaways seem to be rare these days since we are all so busy and wrapped up in whatever our lives demand. You can getaway ... or you can really get away. 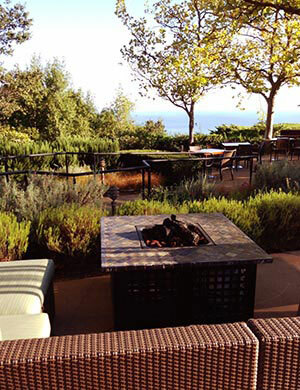 The Ventana Big Sur Inn may be one of the few places where the premiun prices are worth it. I can almost guarantee that when 15 years have passed, and you forget about the many places you visited, this one will not be forgotten.